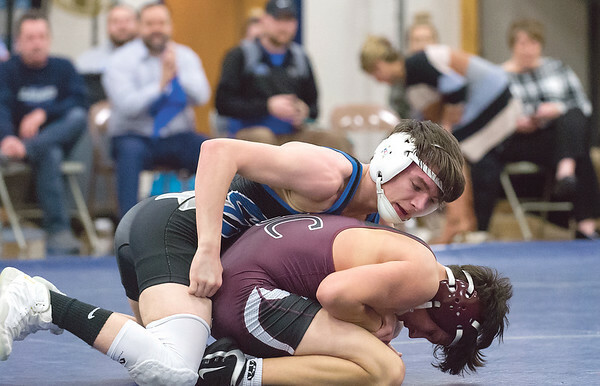 BRISTOL - The Bristol Eastern wrestling team had plenty of energy on Senior Night in front of its home crowd on Wednesday. A packed gym was on hand to watch the Lancers take on rival Bristol Central in the team’s final meet before the postseason, and the Eastern bench was rocking with every passing victory in a 64-3 thumping of the Rams. For the Lancers, there was more at stake than bragging rights in a rivalry. Fresh off its first dual-meet loss in nearly three years, Bristol Eastern was out to prove the defeat to Simsbury was merely an anomaly in another march to the Class L state championship. By winning on Wednesday night, the Lancers showed they were not only ready to put last Saturday’s rare defeat behind them, but to embrace it as well. Head coach Bryant Lishness believes the end of 51-dual win streak was the best thing for his team. There’s often debates on whether a loss is ever actually beneficial to a team, regardless of the sport. If a team is working its way to an undefeated season, discussions will tend to focus on whether a defeat would be a good lesson to reignite motivation, or if it is simply a fabricated narrative to give a top-tier group some kind of area of its success to call into question. Lishness is in the former group, believing the loss was a way to send an added jolt through his group, reminding them of what’s at stake, and that the team is not invincible. Judging by the Lancers’ performance against their rivals, the message was well-received. Bristol Eastern will now be heading into the CCC Tournament with a newfound sense of confidence that they believe has come at just the right time. With Class Ls just over a week away, Lishness and the Lancers are ready to put their loss behind them, while appreciating that it happened. Posted in The Bristol Press, Bristol Eastern on Thursday, 7 February 2019 21:46. Updated: Thursday, 7 February 2019 21:48.